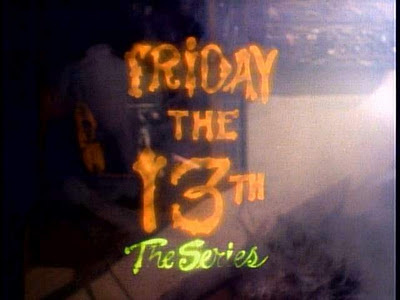 In the mid to late 80’s a slew of television shows started up based on the success, or name, of popular horror films. The Hitchhiker, Freddy’s Nightmares, and Friday the 13th all had television shows that tried to emulate the film, though some didn’t seem to really try. Friday the 13th: The Series was definitely not the best, but it was the one I was dedicated to watching over the others at the time. I can’t tell you how long I waited for Jason Voorhees to come popping out the woods wearing the ski mask and wielding the machete. Alas, he never did, in fact, many of the elements from the Friday the 13th films never even made it into the show. There was very little blood, they never journey to Camp Crystal Lake, to tell you the truth…most of the show was shot in an antiques store. I still waited. So, the show is basically about two antique storeowners, who inherit the store after the death of their relative. What they don’t know is the previous owner made a deal with the Devil, who cursed the antiques, and now the owners must recover the cursed artifacts sold from the shop. Yes, I should have realized, after that synopsis, years ago that I would never see Jason Voorhees. I actually remember being bored with the show as a kid, but a few episodes stuck out to me. One was a show called The Scarecrow, which featured, as you might have guessed, a cursed creepy scarecrow. The other was an episode called Faith Healer, in which a preacher finds supernatural power in a cursed glove, which enables him to exact some self-righteous murder. 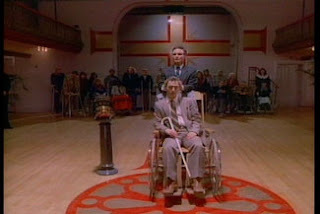 What was interesting on my current re-watching of this show, actually only those two episodes, was that David Cronenberg directed Faith Healer!!! This show was difficult to watch as a kid, and even more difficult to watch as an adult. However, nostalgia did take me back to fun time for television, when my favorite horror films were being crossed over to television. I’m still waiting for television to incorporate some of those crossover identities from the 80’s. I remember hearing ramblings about one of my favorite current shows, Supernatural, wanting to bring the Friday the 13th villain to the show. Jason Voorhees making a cameo…that would be must-see-TV. Day 18 still waiting for my hockey mask.